yep,Mom but also both grandmothers taught me too! That is so cool, Heather! Do you still sew? This sounds like a great book. The combination of learning sewing along with those little extras (teaching kids proper place settings - wow!) is a wonderful way to help kids and moms alike. This book would make a great gift for young moms, and grammas, too. Hi Susan! I am really enjoying this book. The sewing projects are so simple, yet with a little creativity, these projects can be turned into something really awesome. I'm putting my own spin on one of the doll patterns in the book and really liking the result. This sounds like such a wonderful book and one every seamstress should have on her shelf! My mother and grandmother taught me how to sew. I have even commented several times that I come from a long line of seamstresses. Sewing with my mother and my grandmother created a very real bound between us. I am so thankful that my mom taught me to sew. Even thought I haven't used my sewing machine in years, it's like riding a bike, I never forgot. My old machine has such a calming effect on my world. It's an awesome stress reliever. What a sweet story about sewing! I learned a lot about sewing from my Mom and Grandmother. My Mom's first sewing machine was a treadle machine! I remember that when I was a child. By the time I got to learn to sew she had a new machine that me and Dad and my brother picked out at the mall in 1963. I learned on that machine and eventually she gave it to me when she got a newer machine. She still has the third machine. I have been sewing cloth dolls and grocery bags. I love sewing. I don't make as much as I used to. Great story! Hi Lacerrose! I'm glad you enjoyed my story. That is so cool you have your mom's sewing machine and the one you learned on. I learned to sew on my mom's 1958 Singer Slant-O-Matic and I'm still sewing with my Sweet Singer. Dolls are my favorite and good for you on the grocery bags. 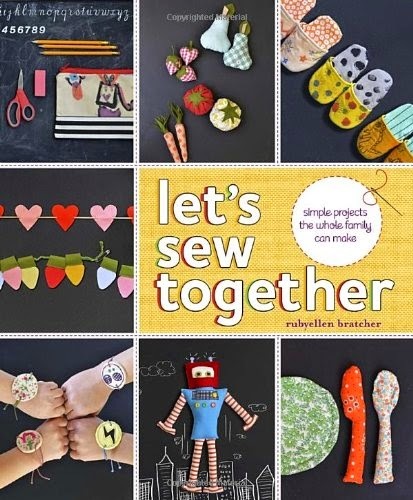 Coletta, that sounds like a very good project books for parents who sew and who want to do projects with the kids. My mom had a sewing machine. I wish she had spent time showing me how to sew. Certainly a book to remember for those interested in sewing. Makes a good gift selection as well. Wonderful story about you and your mom, so sweet. My mom sewed all of my figure skating dresses, so although I didn't learn to sew I did get to watch her in action. Enjoyed your review Coletta. The way you describe this book with its sewing and living lessons combined reminds me of my days in home-economics class way back in Jr. High School.